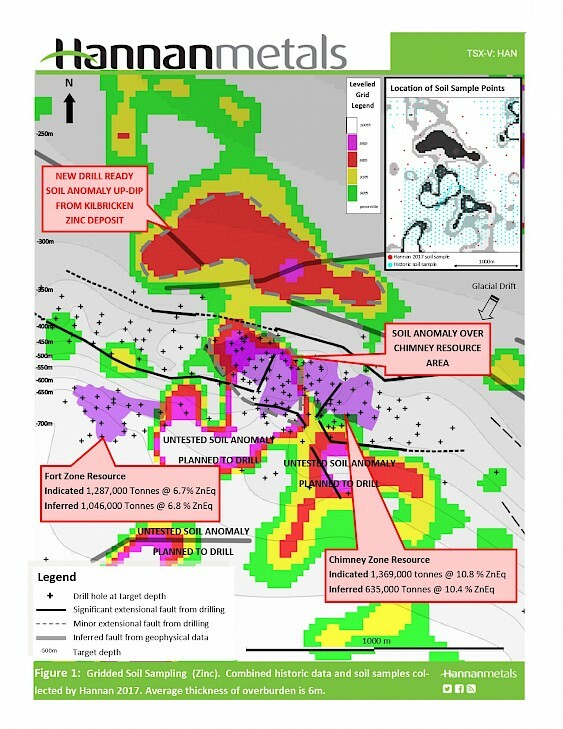 Vancouver, Canada – Hannan Metals Limited (“Hannan” or the “Company”) (TSX.V: HAN) (OTCPK: HANNF) is pleased to announce new soil geochemical sampling results that has identified a large and coherent anomaly up-dip from the mineral resource area at the 100%-owned Kilbricken zinc-lead-silver deposit in County Clare, Ireland. The geological context of the soil anomaly makes it a high priority target for immediate drill testing (see Figure 1 below). Two diamond drill rigs are currently in operation at Kilbricken drilling six days a week. The current 1,000 sample soil program has focused on acquiring new samples within an area of >40 km2 of unexplored Waulsortian Limestone (Figure 1). Soil samples have been acquired by hand auger at 50cm depth on average (up to >1m). The sample material is brown earth, sometimes with a clay/sand/peat or chip components from the A horizon. Thin glacial cover (1-5m thick) is common over the project area. In combination with the re-interpretation and quality control of >18,000 historic soil samples, the new data reveals multiple new anomalies of Zn-Pb (with associated trace elements), some at target depths <300m. The anomalies show strong correlation with many prospective faults previously interpreted from aeromagnetic, gravity and seismic data. Two diamond drill rigs are currently in operation at Kilbricken drilling six days a week. To date, three diamond drill holes have been completed (DH217-219), with two in progress (DH220-221) for a total of 2,852.4 metres drilled from the current 13 hole, 8,500 metre drill program. Two holes have been reported from the Fort Zone with highlights of DH217: 3.2 metres @ 8.4% Zn, 72.8% Pb and 388 g/t Ag (81.2% Zn+Pb), an infill hole; and DH218: 4.0 metres @ 0.7% Zn, 8.9% Pb and 31 g/t Ag (9.6% Zn+Pb), a 50 metre step out hole. DH219, drilled to extend the Fort Zone, has just been submitted to the geochemical laboratory. DH220 (in progress) is testing the extensions of the Chimney zone to the east and DH221 (in progress) is testing a large soil anomaly 250 metres east of the Fort Zone, looking for a repeat mineralized body. One drill rig will be moved to test the new soil anomaly described here, at month’s end. Analytical samples were transported by Hannan personnel from site to the ALS Loughrea located at Dublin Road, Loughrea, County Galway, Ireland. At the laboratory samples are dried, sieved to 180 um fraction, digested in aqua regia, and analyzed by the multi-element ICP-MS method ME-MS41. The QA/QC program of Hannan consists of the systematic collection of field duplicates and insertion of blanks at the start of each batch. In addition, ALS inserts blanks and standards into the analytical process. Hannan Metals Limited has 100% ownership of the County Clare Zn-Pb-Ag-Cu project in Ireland, which consists of 9 prospecting licences for 32,223 hectares. Zinc remains in tight supply amidst rising demand and stagnant supply. Ireland is a leading global jurisdiction for zinc mining and exploration. In 2015, Ireland was the world’s 10th largest zinc producing nation with 230,000 tonnes produced. The maiden mineral resource, dated July 10, 2017, immediately ranked Kilbricken as one of the top ten base metal deposits discovered in Ireland by tonnes and grade. Total indicated mineral resources were calculated as 2.7 million tonnes at 8.8% zinc equivalent (“ZnEq”), including 1.4 million tonnes at 10.8% Zneq and total inferred mineral resources of 1.7 million tonnes at 8.2% ZnEq, including 0.6 million tonnes at 10.4% ZnEq.